lola's secret beauty blog: Equitance Sunscreen Broad Spectrum SPF 36 | Review and 20% Off for Lola's Secret Beauty Blog Readers! Equitance Sunscreen Broad Spectrum SPF 36 | Review and 20% Off for Lola's Secret Beauty Blog Readers! While the summer has given way to the fall, we must remain vigilant about applying, and reapplying, our sunscreen every single day. In Los Angeles, the seasons are less distinct, and it tends to be rather easy to remember to use sunscreen, but none of us can afford to forego using daily sunscreens. One of my recent facial sunscreen finds is Equitance Sunscreen Broad Spectrum SPF 36, and this pragmatic formula is a dual-purpose primer and sunscreen in one. The lightweight texture has a thin liquid consistency that effortlessly glides across the skin, and dries down quickly. There is a comfortable velvety, emollient texture from the silicones– which serves as a perfect makeup primer, and I definitely find that it increases the longevity of my makeup. However, since I reapply my sunscreens frequently (about every 80 minutes), I did not test how long a single application preserved the longevity of my makeup– since that would clearly compromise my protection against extended sun exposure. It is very important to shake this sunscreen before use in order for the mixing balls to thoroughly mix the ingredients. It is also important to note that I experienced no pilling of makeup– which is definitely a deal breaker for me, and something that can occur when particular ingredients from the sunscreen and the makeup do not play well together. Effectively safeguards against UV rays and free radicals. The perfect primer for makeup, this sunscreen filters UV rays and environmental stressors that contribute to hyperpigmentation, photoaging and skin-harm. Enhanced with brightening and moisturizing ingredients, the fast-drying formula primes the skin and performs flawlessly under makeup. Linoleic Acid is extracted from safflower seed oil and purified. We found that linoleic acid’s primary effect helps to significantly minimize the appearance of dark spots. It also promotes the exfoliation of the stored melanin that form dark spots. Ascorbyl Glucoside is a vitamin C derivative with skin-brightening powers. In liquid topical skin care formulas, vitamin C derivative is more stable, maximizing its beneficial function better than vitamin C itself. Stearyl Glycyrrhetinate, made from licorice, possesses soothing properties. Cherry Blossom Leaf Extract is culled from the Japanese sakura tree and possesses properties that sooth and soften rough skin. Shell Ginger Extract is derived from the Japanese alpinia speciosa leaf. Its intense moisturizing properties help brighten the skin. Directions: Before use, shake well until the mixing balls inside can be heard multiple times, then smooth over entire face and neck as a final step in your morning skincare routine. Reapply at least every 2 hours. Overall Assessment: I have been reaching for this sunscreen on a daily basis lately, and am very pleased with the results. If you are seeking a new facial sunscreen that is likewise an effective primer, then Equitance Sunscreen Broad Spectrum SPF 36 is definitely worth your consideration. $30.00 for 29ml 0.98 fl. oz from Equitance (Unaffiliated Links). While you are out and about, do you reapply this over your make up? Can't really picture that working well. I try to, but it doesn't always happen! It's much easier to do, if when I make pit-stops at home when I am out and about. When I am at work, however, I am usually too busy to take a minute to refresh my makeup and reapply sunscreen. I love this type of primer/sunscreen in one. I have one, but it's brownish. I like this white one much better! I do too, Allison! The white color completely disappears, and I would think that there might be some residual tint with a brownish one- unless of course it happens to be a perfect color match for one's skin tone! Sounds good! Love the way that it can double as a primer. It really is a wonderful sunscreen, and the fact that it doubles as a fantastic primer is even better! I love it when you can use sunscreen as a primer - that saves a step, and helps reduce chances of a mess. Me too, the fewer steps, the better! I'm a sunscreen hoarder! This is a nice formula, especially that super high zinc oxide content. I need to try this one! I have a pretty good size hoard as well, and this is definitely a good one. Yes, the super high zinc oxide content definitely is a plus in my book! 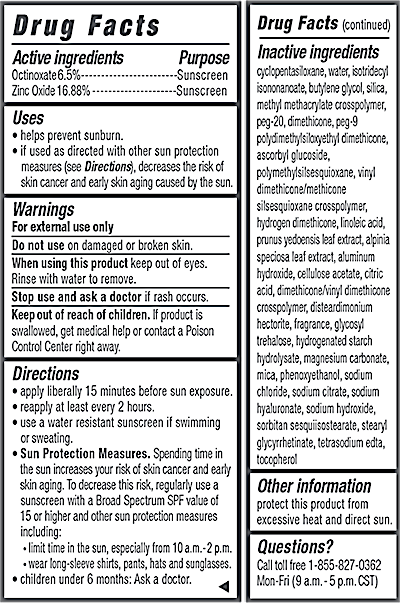 When I last ran a giveaway for a sunscreen I had people comment about what sunscreen they used. I was shocked at how many people said they don't use one. This sounds like a great one and people need to use sunscreen. Wow, that is really surprising!!!!!! I would have thought the exact opposite, and with all of the information out their about its importance, you would think that more people would realize that it is an essential step before stepping out of the house! I love the packaging, it almost looks like a makeup item. Sunscreens are an everyday must for me, especially here in FL! It does! They are an everyday must for me as well– you can't go without in Los Angeles! Sunscreen use is one thing I always tell patients! I really hope that they listen! Thanks for introducing me to this new brand! I am surprised that I haven't seen more bloggers mention this, as it's a really great sunscreen. I like that it wears well under makeup. 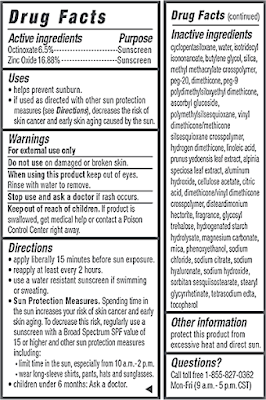 I know, it is very strange that everyone isn't talking about this sunscreen! It really is a great sunscreen, and you are so right that it wears very well under makeup! I love this stuff! These kind of super thin SPF are my favorite! I love the super-thin versions as well, they tend to play so well with makeup– plus this one doubles as a primer!